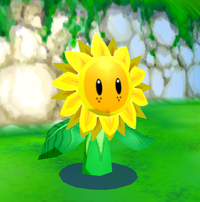 Sunflower Kids, also known as Kid Sunflowers and Sunflowers, are a kind of flower found on Isle Delfino in Super Mario Sunshine. They live outside of Pinna Park. At one point, the Snooza Koopas start nibbling on their roots, causing them to turn brown and start to wilt. Mario has to destroy each Snooza Koopa to turn each Sunflower Kid back to its original healthy state. There is also a giant sunflower called the Great Sunflower, who gives Mario a Shine Sprite after every Sunflower Kid has been restored. ↑ 1.0 1.1 Hodgson, David S J, Bryan Stratton, and Stephen Stratton. Super Mario Sunshine Prima Official Strategy Guide. Page 101. ↑ Hodgson, David S J, Bryan Stratton, and Stephen Stratton. Super Mario Sunshine Prima Official Strategy Guide. Page 20. This page was last edited on January 28, 2019, at 14:42.